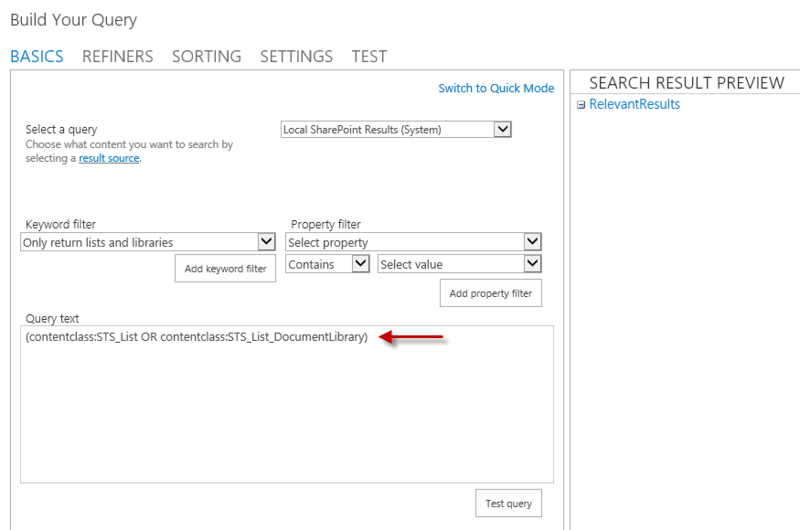 Searching is hard to completely understand using SharePoint 2013. Is there a way to restrict search results to come from a certain view in document library? It is possible to build a query? I am thinking that I can restrict by Tag to make this happen, but I am not sure. Is it possible to produce search results from a certain view? Try adding a search results webpart to you page, and edit the properties. Then click on "change query". You can specify a tag there. If you use SharePoint 2013 Enterprise you can also you the CSWP. You cannot "Query a View". You can evaluate the view filter criteria and replicate the query in search. So if you want to filter on a Hashtag simply query the hashtag, like #SharePoint. If you are using other types of metadata you can query that too. The search engine is actually very controllable and predictable. If you are struggling I recommend the excellent book on the topic, Search Queries Explained. http://www.techmikael.com/2015/01/sharepoint-search-queries-explainedthe.html Mikael's blog is excellent as well. Not the answer you're looking for? Browse other questions tagged 2013 document-library search search-results or ask your own question. How to allow searching within documents / content?